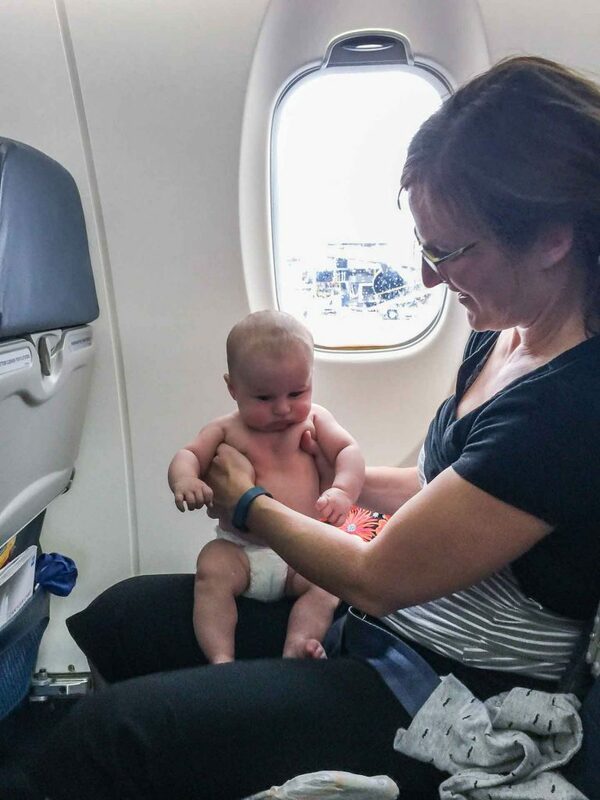 Flying with a baby for the first time can be intimidating, but don’t let that dissuade you from planning a trip. In reality even a long haul flight with baby is really only a very small portion of your entire trip. And you will get through it. It might seem like an eternity at the time, but once it’s all over it’s time to enjoy your trip. Or the other likely possibility is that it won’t be nearly as bad as you imagine or have built up in your head. And if there’s one thing we know for sure it’s that your last flight with baby will not necessarily be indicative of what’s to come. Babies change so fast. Every flight and every time you travel with baby will be different. 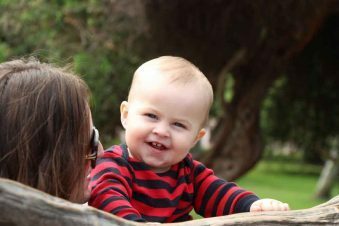 So even if you’ve had a bad experience flying with your baby in the past, don’t let that stop you! Every flight and every time you travel with baby will be different. 1.1 Do I Need a Passport for Baby? 1.3 How Old Does a Baby Have to be to Fly? 1.12 Is it Possible to Fly Without a Stroller? 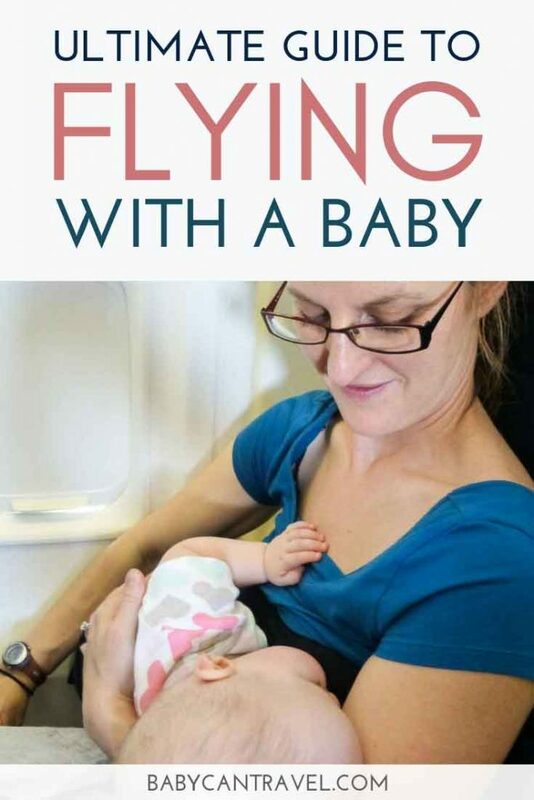 There are many blog posts online with tips for flying with a baby. Some of these baby travel and flying tips will work for your family and some will not. Here are the top flying with baby tips that we have, choose the ones that you think will work best for your family and disregard the rest! Do I Need a Passport for Baby? If you plan to fly internationally with a baby, your baby needs a passport. If you are flying domestically, you likely only need your baby’s birth certificate to travel. Either way, you will need proper identification to fly with your baby. Don’t forget, typically passports need to be valid for 6 months beyond the time of your trip. If you are flying solo with your baby, you may need a consent letter signed by the other parent. The Government of Canada strongly suggests that children (including babies) carry a letter of consent if traveling internationally with only one parent or guardian (or anyone else other than the parents). The U.S. Customs and Border Protection has a similar recommendation for a consent letter for parents who are traveling internationally with a baby alone. You may also need visas for both you and your baby, depending on where you are going. How Old Does a Baby Have to be to Fly? If you have a need to travel with your newborn very shortly after birth, be aware that there are restrictions on the minimum age you can fly with an infant. For some airlines, you can fly with a newborn as early as 48 hours, if there were no complications with the birth and you didn’t have a c-section. More commonly in North America, your baby will need to be at least 7 days old to travel by airplane. It’s best to check with your specific airline before buying tickets. If you want to fly with your newborn within that restricted time or if there were complications, you may need to get approval for travel from your doctor. Before you go ahead and book your flight with a baby, you’ll need to decide if you are booking a seat for baby or not. If you are flying internationally with a baby, your baby will need a ticket even if you are flying with an infant on lap. If you aren’t able to book this online, you will need to call your airline after booking your flight to ensure you get a ticket for your baby. In the event that you need to book a flight before your baby is born, you will need to call the airline after your baby is born to ensure you get a ticket in your baby’s name. If your baby will fly as a lap baby, then they fly free domestically. If you are flying with a lap infant internationally, it is not free. You will typically be charged 10% of the adult fare. Again, we recommend calling your airline immediately after booking your flight to get a ticket booked for your baby to ensure you are paying the 10% of the fare of the flight you just booked. You don’t want any surprises at the airport! If you are buying a seat for your baby or toddler, then you will pay the adult fare for that seat. In this instance, you should check if your airline offers a discounted ticket for children. Not all do, but depending on the route or direction, you might be able to save your family money on the flight. 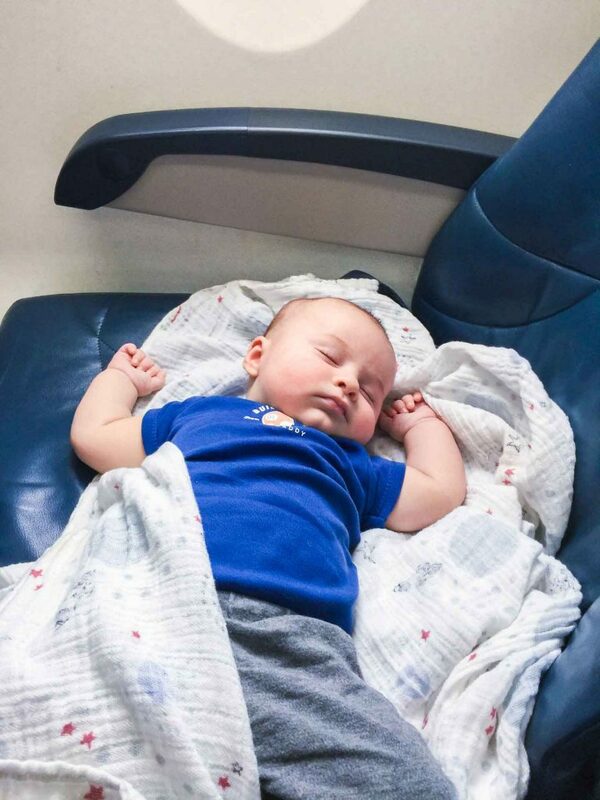 If you are hoping to get your baby to sleep on the plane, reserving the right seats will make a difference! If you are flying with a lap infant, reserving a window seat will give you more privacy. And stay away from the airplane bathrooms, where people tend to congregate and talk. Or worse yet, the slamming bathroom door which is likely to keep your baby from sleeping on the flight. Bassinets are not available on all flights. Check with your airline to see if they are available. You may need to call your airline directly, but it will be worth the effort. Reserve the seats that will enable you to book a bassinet. These are typically only the bulkhead seats so there will only be a few spots where a bassinet can be made available. Again, call your airline. Bassinets, if available, are on a first-come, first-serve basis. Have a back up plan on how you’ll get your baby to sleep on the flight in the event that you don’t get one. Be aware that bassinets are only provided after take-off and before landing. In addition, you will need to pick up your baby in the event of turbulence. Consider getting a CoziGo Bassinet and Stroller cover to help your baby sleep during the flight. The safest way to travel with a baby or toddler, is to purchase a seat for your baby and bring a car seat. As mentioned above, this will cost you either a discounted child fare or the full adult fare. Other options, if there is a chance you will be able to snag an extra seat on your flight, you can bring your travel car seat all the way through security and to the airplane. Talk to the flight attendants when you check in and again at the gate to see if you can get that extra seat for your baby. If it doesn’t work out then you will need to gate check your car seat. What baby items can you bring on the airplane with you for your flight with a baby? Whether you are flying with a lap infant or you have bought a seat for your baby or toddler, you can usually check two baby items. These will typically include a car seat, a stroller or a travel crib. We have at times travelled with a baby backpack carrier and used it as one of our checked baby items. It’s best to gate check the stroller and car seat, but you can check them along with your luggage. We recommend protecting them with a car seat travel bag and even a travel bag for strollers if you plan to check them. Alternatively, as we mentioned above, even if you have not bought a seat for your baby and the flight is not full, you can bring the car seat to the gate and attempt to get a spare seat on the flight for your baby. You’ll likely want to bring your stroller along too to help carry everything. Looking for a lightweight travel stroller? We have a full comparison of the best lightweight strollers for travel! As for other baggage allowances, please check with your individual airline on the rules, but typically if you have not bought a ticket for your baby, they do not get a baggage allowance. You can likely bring an additional small carry-on for your baby with their necessities (diapers, wipes, baby food, etc). If you have bought a ticket for your baby and they have their own seat, then their baggage allowance is the same as that of an adult plus their baby items. Please confirm the rules for your specific flight and airline, since this is likely to change as airlines continue to charge a fee per bag. Before you plan to bring your car seat on a flight, make sure that the car seat is approved for air travel. How do you know your car seat is approved for air travel? It should have the date it was manufactured plus it will specify the design standards for which it is approved (i.e. FAA-approved child restraint system). The best way to find out what you need for your particular airline is to google the airline plus “traveling with children”. Most will specify how to ensure your car seat will be approved for air travel. Check with your airline about any specific policies they have on bringing car seats on the airplane and the size requirements. Try to board early or if they allow families with small children to board first. This will give you more time to install the car seat. If you had hoped to keep your baby off the airplane until the end of boarding, then one parent should go on and install the car seat. The car seat will need to be installed either in the window seat or in the middle seat, if seated in the center of the airplane. It can not block the exit for any seats on the airplane. It also can not be installed in an emergency row. If you plan to fly with your car seat frequently, consider getting a travel car seat that is lighter and easier to transport. If you haven’t bought an extra seat for your baby, your best bet for getting an extra seat free of charge is to arrive early. Ask at check-in if the flight is full and if there is a possibility of getting the seat next to you blocked off. Then bring your car seat through security with you. Ask again at the gate to make sure you’ll have the extra seat. If you aren’t able to get a seat secured, you will need to gate check your car seat. Bring a car seat travel bag along in case this happens to protect your car seat when you gate check it. Take the time to review the manual of your car seat so know how to install it with the lap belt on the airplane. If the car seat is to be installed rear-facing, you might need a seatbelt extender that you can request from the flight attendant. Which lightweight car seat to buy for travel? Cosco Scenera Next car seat is the one that’s most recommended because it’s light, gets great ratings, and it’s easy to carry. Looking for a checklist for flying with a baby? Getting organized is key and having a packing list for travel with a baby will ensure you don’t forget anything (we have a Flying with Baby Checklist & Packing List available for download at the bottom of this post). You can also see all the products mentioned in this post on our Flying with a Baby shopping list on Amazon. Getting through security can leave you sweating and this is where packing light is really valuable. First, look for a family line or take advantage of Nexus/Global Entry (if flying to/from the US or Canada). Next, put your baby in a baby carrier for security. This will allow your hands to be free to remove any liquids from your bag, fold up your stroller, etc. There’s a chance you won’t have to remove your baby from the carrier, but this isn’t a guarantee. It will be easiest if you travel with a lightweight travel stroller that is easy to collapse to make getting through security easier. Don’t forget to empty all the pockets of your stroller before putting it through the x-ray. If your stroller won’t fit in the x-ray, inform the security personnel, who may be able to do a physical/visual examination. Breastmilk, formula and baby food do not fall under the 3.4 ounce (100m) liquid restriction and can be brought through security in reasonable quantities. You will still need to remove the breastmilk, formula or baby food from your bag for screening. The TSA website on traveling with children has the information on how it will be screened. It never hurts to print this out and have it with you in case you run into an problems. Is it Possible to Fly Without a Stroller? I can speak from experience that it is possible to fly without a stroller. We have on several occasions flown with just a baby carrier, to keep it light. We hadn’t brought the car seat with us and rented a stroller at our destination through a reputable baby equipment rental company, so we checked our bag and brought only carry on essentials for baby with us. We only recommend this if you are traveling light! 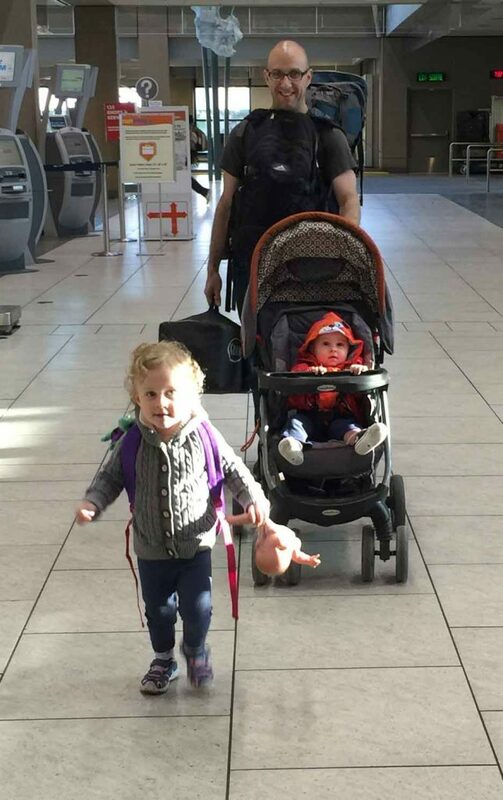 We also think the Mountain Buggy Bagrider is a great stroller alternative for the airport. 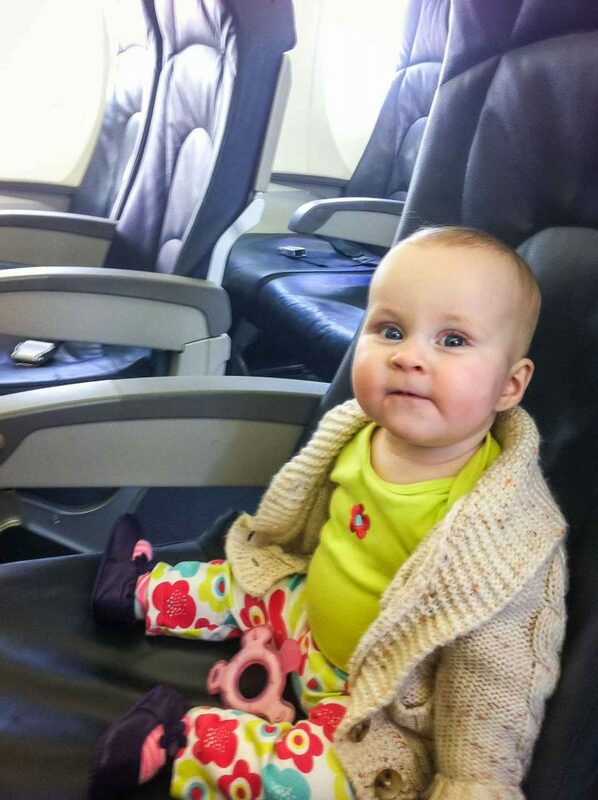 It’s no surprise, but advice on flying with a baby is amongst the most asked questions! Many parents worry about how they are going to keep their baby entertained for a long haul flight, especially if the baby is mobile. The best advice I can give here is encouragement rather than advice. You will survive flying with a baby. And chances are it won’t be as bad as you think. 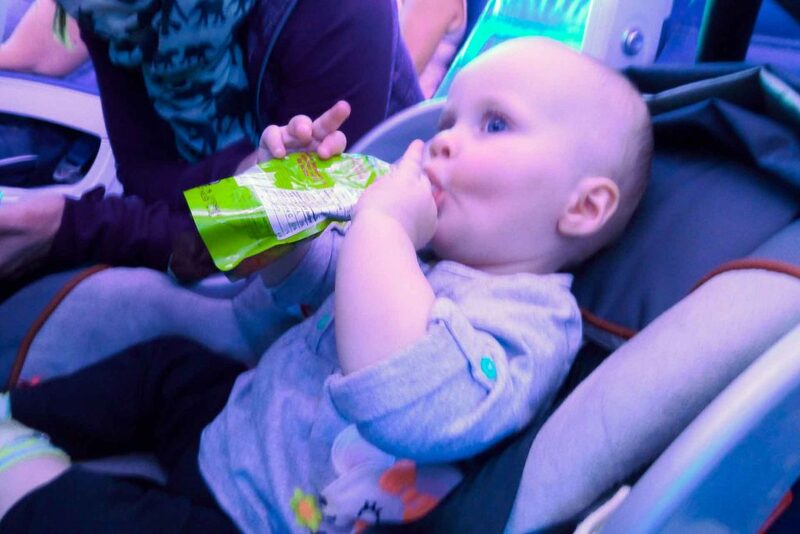 Your baby will enjoy the new environment and everything on the plane will become a new travel toy for your baby (this includes the seatbelt, plastic cups and spoons and the window shade). Let them explore! Your part will be to stay calm. Your baby will feed off your energy. More importantly will be to set your expectations accordingly. Go into the flight expecting that you will spend the majority of the time entertaining your baby and any sleep you get will be a bonus! Try to pick a flight that will give you the best chances of success in flying with your baby. If you think it is unlikely that your baby will sleep during the flight, then choose to fly early in the morning when your baby is at her happiest. If you can fly around nap time, this will be your best bet to get your baby to sleep on the plane. If you have a long haul flight, getting an overnight flight that leaves shortly before your baby’s bedtime will be your best bet. This will give your baby time to explore the airplane and the new exciting environment before you can start the bedtime routine. With any luck your baby, once asleep, will sleep for the remainder of the flight. Some people suggest not sticking with a routine and just going with the flow. This will definitely work for some babies but not all. If you baby is a nightmare if they are overtired, then you may still want to try to get your baby to sleep on the flight. On the other hand, try not to get stressed about whether your baby will sleep or not. I have done that and it didn’t make anything better. 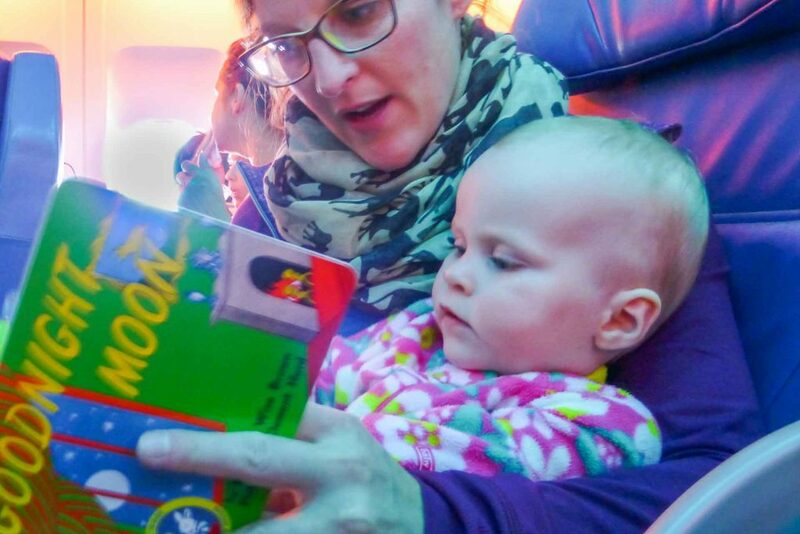 In fact our baby was up for 12 hours once without a nap when she was 10 months old (she refused to sleep on the flight) and though it was a lot of work to keep her entertained on the flight, she was happy enough. We got to our destination and she fell asleep in the carrier instantly. Bring a baby carrier. The most important thing you’ll want to bring on the flight is a baby carrier. This will allow you to keep your baby close and you can walk or stand to help your baby get to sleep. This will enable you to have hands free when your baby does fall asleep. Keep in mind, you will not be able to use it for take-off or landing. Choose your flight time that has the most success for getting your baby to sleep. Use your nap or bedtime routine. Baby’s like the comfort of routine. Take the time to change your baby into pajamas, read a familiar story and feed your baby just like you would at home. Feed before sleep. While you’ll likely be feeding your baby during take-off to help with their ears, you should also include this in their bedtime routine just like at home. Don’t try to get your baby to sleep too soon. Give your baby time to be excited in the new environment before you attempt a nap. Try to get your baby to sleep before they get overtired. Letting a baby or toddler get overtired can be a recipe for disaster. This may be out of your control, but if possible start your bedtime routine as soon as you can to keep a similar schedule as your typical day at home. Bring a travel car seat. If your baby sleeps well in a car seat, not only is that the safest way for a baby to fly but it might be your best way to get your baby to sleep. Get extra space. Even if you didn’t purchase a seat for your baby, try to get an extra seat for your baby if the flight is not full. Having the extra space and privacy will help make flying with an infant or baby easier. Don’t get stressed. Knowing you are calm and stress free will keep your baby from feeling anxious and should help get your baby to sleep on the flight. Reserve your seats. Choose seats that either give you the option of using a bassinet or the window for more privacy. Also, make sure your seats are not too close to the toilets, where people tend to congregate or the slamming door may continually wake your baby up. Flying with a toddler? We got so much use out of our inflatable travel bed for toddlers on airplanes and he slept the entire flight almost every time! There’s a real lack of consistency when it comes to change tables and diaper changing on a flight. The flight attendants will let you know which toilet has the change table. If they don’t, be sure to ask them. They may also give you a bag to put the dirty diaper in before putting it in the garbage, but not always. As you know, the toilets are extremely small and trying to maneuver in there with a wriggly baby is no easy feat. Plan to take only the essentials with you when you change a diaper on a plane. It’s best to have them easy to grab at the top of your carry-on by putting a pack of wipes, diaper, change mat and extra change of clothes in a Ziploc bag or diaper changing clutch. You can grab diaper changing essentials, baby and be on your way. Make sure you change your baby’s diaper right before you board the plane. You just never know how long you’ll be waiting for those seatbelt lights to come off and you can get up again. I’ve seen it asked in forums if you can change your baby at your seat. This is not recommended, however I am willing to bet there are plenty of moms who have changed their babies on their laps if absolutely necessary. 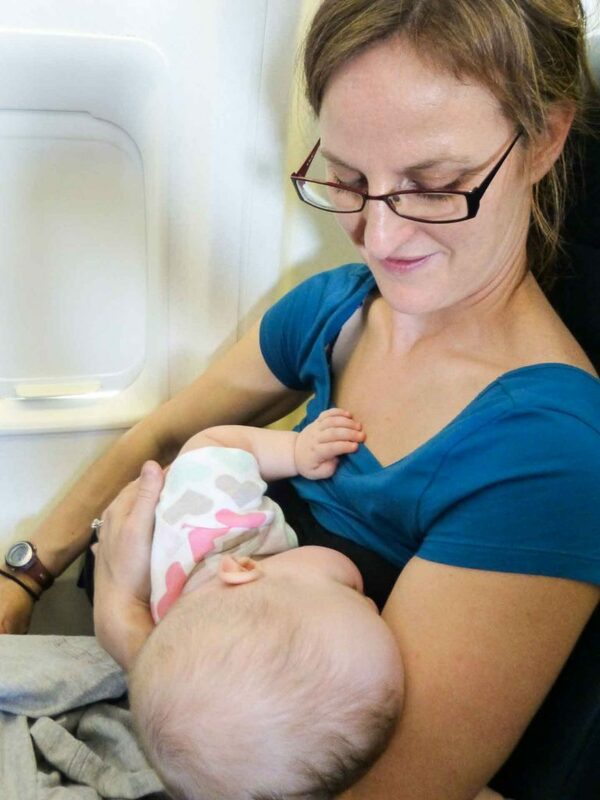 If you have any concerns about breastfeeding while flying you can look into your airline’s policy about breastfeeding on an airplane. There shouldn’t be any issues with it, but it doesn’t hurt to be armed with information. The window seat will give you the most privacy for breastfeeding during your flight. 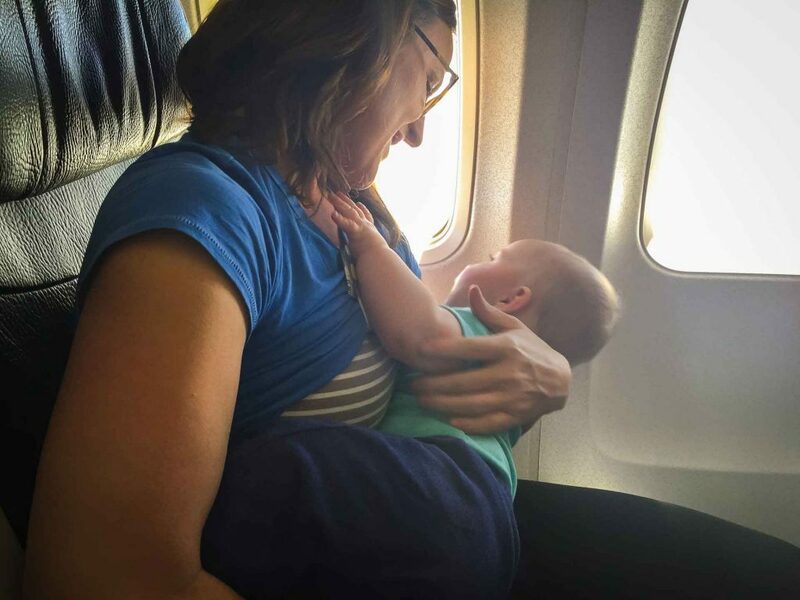 If you will need to pump during your flight, you can get all the tips for pumping on an airplane in our post flying with a baby and breastfeeding. 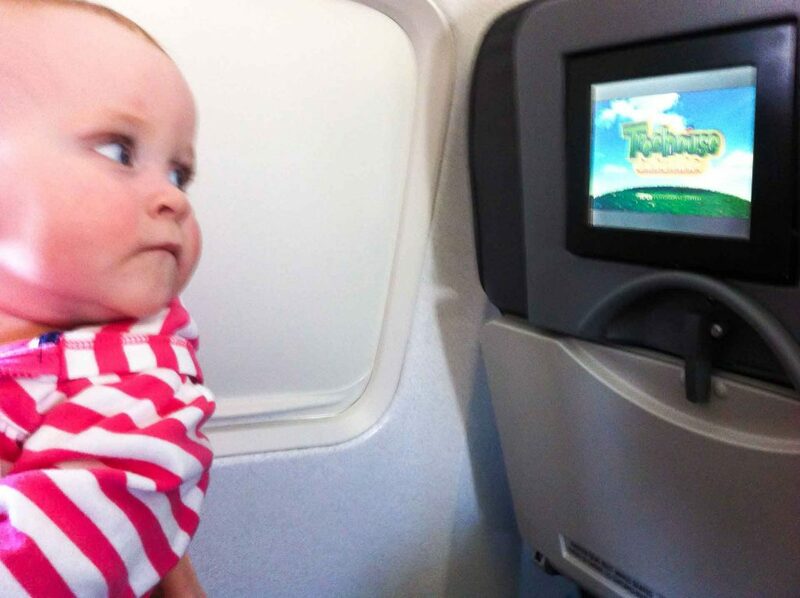 Keeping your baby entertained on a plane doesn’t have to be difficult. We suggest keeping it simple and making use of what you have around you. 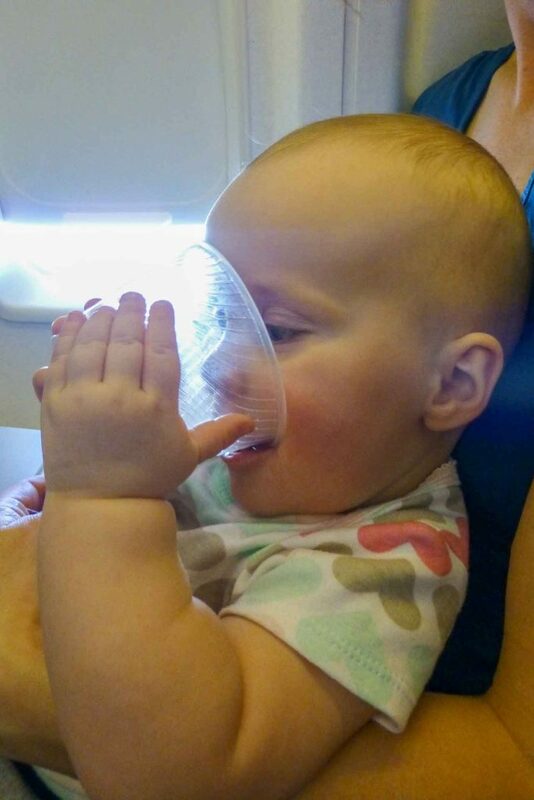 Trust me when I say that your baby will be far more entertained by a plastic cup and spoon on the plane than any toy. That being said, it won’t hurt to make sure you have a few favourites or a couple of new toys with you. You can even put away a favourite toy for a few weeks at home, then bring it back out for the flight. You can get more ideas from our full list of travel toys and airplane activities for babies and toddlers. Flying with an infant is likely to be your easiest flight. Newborns and infants sleep a lot and will easily be lulled to sleep by the engine noise of the plane. Bring a carrier to help get your baby to sleep and use all our flying with a baby tips above. Flying with a lap baby or a lap toddler gets a little more complicated. Once your baby is on the move, it’s not likely they are going to want to sit in your lap. This will be especially difficult with a lap toddler, this post has all our tips for flying with a toddler. This is the time when you will want to do whatever you can to get some extra space on the airplane, if you haven’t purchased a seat for your baby. Make sure you arrive early to give yourself the best chance of snagging any spare seats. Also, be as polite and friendly as possible to the check-in agents, the gate agents and the flight attendants. They will be your best allies throughout the flight. If you need to, take your baby for a walk down the aisle. Let them explore the plane (within reason). Find someone who wants to play peek-a-book with your baby. 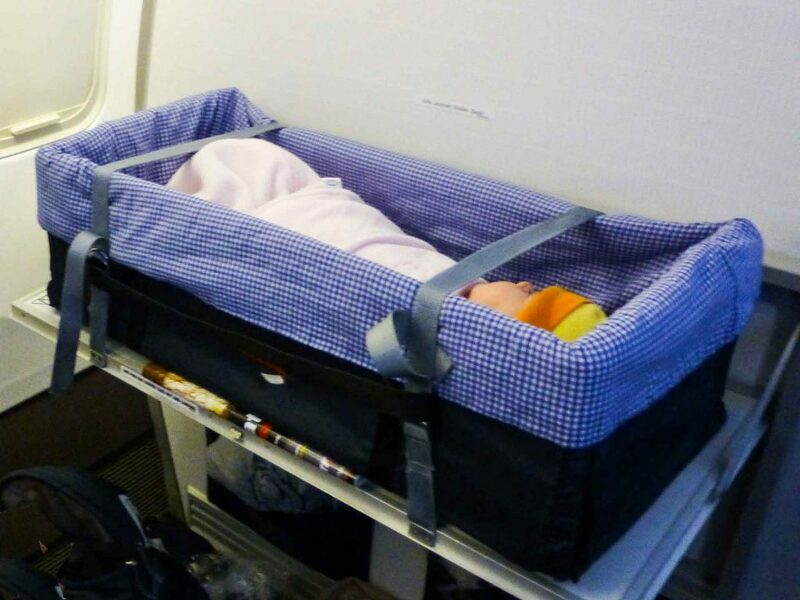 Encourage your baby to get some sleep on the flight. Finally, try to stay calm and just know that you will get through the flight. Talk to your airline. 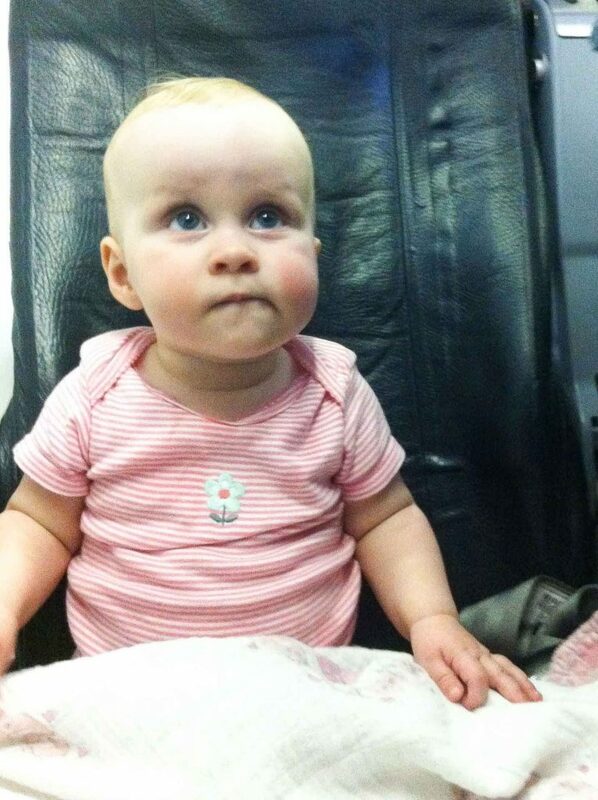 Some airlines like British Airways will allow you to choose your seats for free when traveling with a baby. Do some research on the airline you are flying with by reviewing their family travel or traveling with children section. Take the time to call them if necessary, it will be worth your time. Check the rules of flying with an infant, baby or toddler. It’s impossible to include all the rules for different airlines and countries in one post because they aren’t consistent. For example in Canada, Transport Canada requires that parents can not travel with more than one infant. If you are flying with twins in Canada you will need one adult for each baby. Book your flight for the best time of day to fly with your baby (if possible) and reserve the best seats for your flight. Feed your baby or give a pacifier during takeoff and landing to help with the pressure change for your baby’s ears. 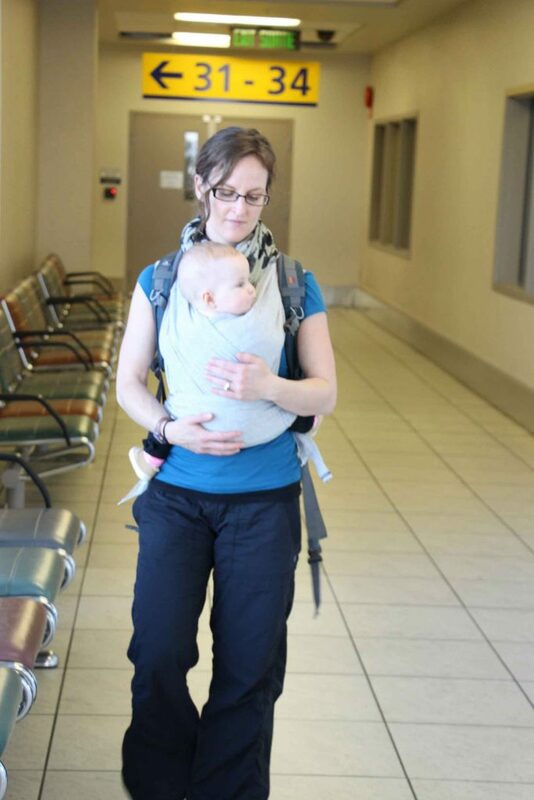 Pack lightly and bring a baby carrier to be hands free. It will make going through security and the entire flight easier. Put your diaper changing essentials in an easy to grab place and only bring what you need to the toilet to change your baby on the airplane. 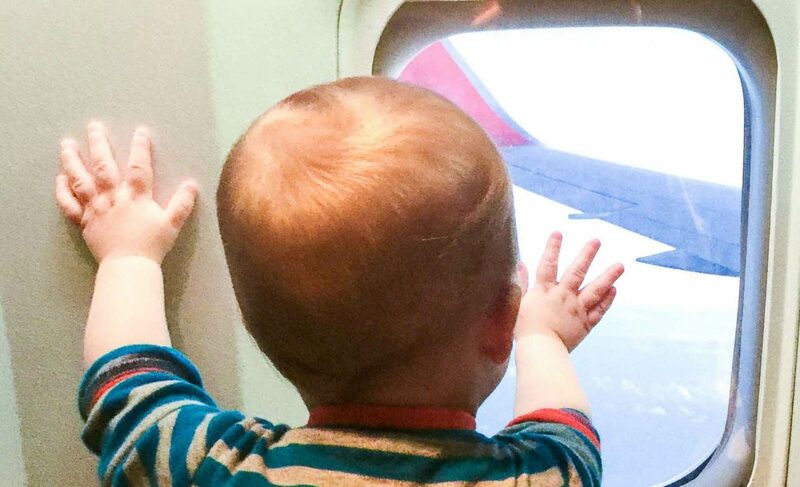 Give your baby as much time to play off the airplane as possible. One parent can board early with the carry-on to get space near your seat, while the other parent can wait to board giving your baby less time on the airplane. Don’t let rude comments upset you. As much as there are people who will be willing to help, there are others who can’t help but be rude. Ignore them and don’t engage them. Above all, don’t let their comments rattle you. You are as entitled to be on that airplane as they are, after all you purchased a ticket just like they did. And they are adults, if they want they can just put headphones on and block out the sound. The last trip won’t be a reflection of the next trip. Babies change so much. If your last flight was a disaster, learn from it but don’t let it scare you off. There may be a few things that you can do differently, but more likely your baby will have changed from that flight. Take help when it’s offered. There are no prizes for doing it alone. Many people will go out of their way to help parents flying with babies, accept their help! Disclosure: This post contains compensated links.